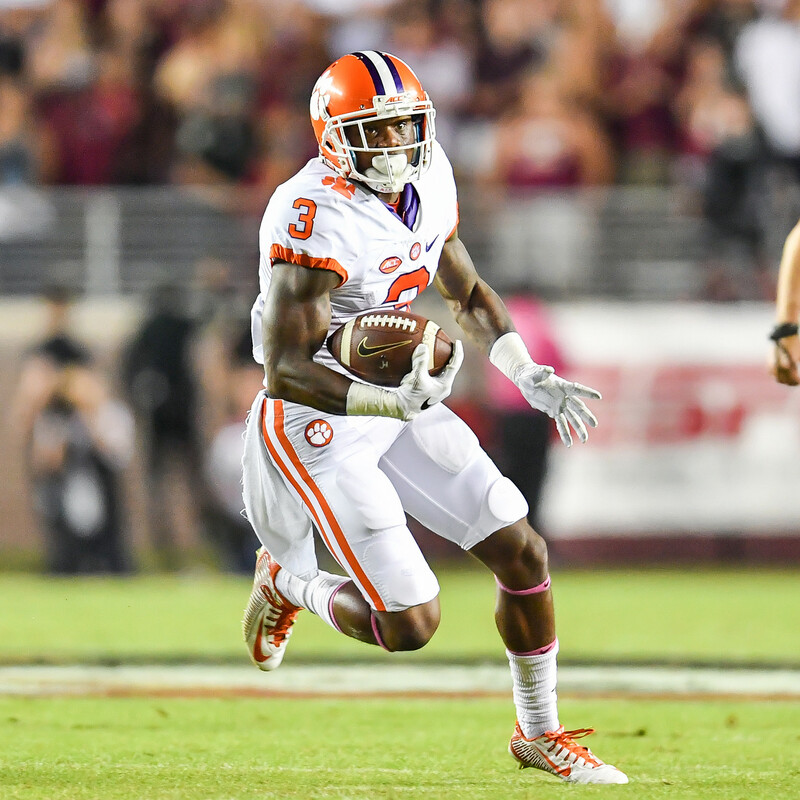 The most exciting 25 seconds in college football has an extra step for Artavis Scott. After he rubs Howard’s Rock and runs down the Hill, he makes his way to the student section to energize the crowd. The short interaction is a big one for Scott, who sees it as a way to give back to the fans who mean so much to him. “One of the biggest things that I love to do is interact with the crowd,” said Scott. “I started to do it in my senior year of high school. I like to get the crowd hyped. “As players, we feed off of it. I love to see the interaction when the fans come out and support us. I love to see that sea of orange, even if we’re on the road. Seeing that they come and support us and they’re having fun and they’re hyped, that gives us an edge. As someone who loves “the family feel of football,” the supportive family atmosphere of Clemson has been something that Scott has always appreciated during his experience as a Tiger, and it was a big part of the reason he chose to come to Tigertown. “The Clemson family has impacted me a lot since I’ve been here. Whatever it may be, they’re always there to support you. And play he has. In his first two seasons, he was an All-ACC wideout and earned First-Team All-ACC recognition from both the media and coaches in 2015. He holds the record for catches by a Tiger in the first two years and is making his way up Clemson’s career receiving yards list, as he is in the top 10. He went over the 2,000-yard mark at Boston College on October 7 and became just the fourth Tiger with 200 career receptions at Florida State. Scott has provided the Tigers with many big plays in his career. There was the touchdown reception in the 24-22 win over Notre Dame in 2015. His 77-yard kickoff return in the fourth quarter changed the momentum of the Louisville game this year. The touchdown catch in overtime against NC State proved to be the decisive points as well. But Scott is not focusing on the records. Rather, he wants to develop into the best version of himself, both on and off the field. Scott has appreciated the opportunity Clemson has given him to be a playmaker on a national scale, but equally important to him are the ways coaches have helped him grow as a person. Scott has made great use of every opportunity at Clemson, and that includes academics. In December, he will join roommate Deshaun Watson as the first Tiger scholarship football players to earn an undergraduate degree in three years. It is a goal he has pursued with vigor. One of those lessons that has impacted the wideout most is the idea of finishing with no regrets. He is a player who enjoys the process and tries to “take it one step at a time,” rather than concentrating on the end goal. The reminder to always leave it all out on the field is something that has stuck with him. After he dons the Tiger uniform for the last time, Scott wants for that purposeful mindset to shape his legacy. But in the meantime, he is going to continue to make the most of every opportunity that comes his way.